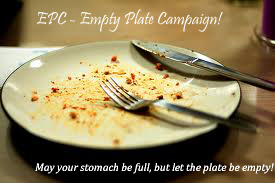 Quadruple Labs: 36Meals.Com Presents EPC - Empty Plate Campaign! 36meals is an NGO which aims at eliminating hunger from the world. We believe in the tagline - "FOOD NOT WASTED IS FOOD CREATED". while having breakfast/lunch/dinner, some people tend to leave a bit of food in their plates. If such left-overs are summed up for a period of 10 days, they can form one complete meal and hence a meal gets wasted. The main thing that 36meals advocates for is preventing wastage of food, as we believe that it's a way to contribute towards the lives of those sleeping with the pain of hunger. It's definitely not the sufficient step, but a necessary one for sure. It's not the complete act of being able to do something for them, but definitely the first step. As the chinese saying goes "A journey of 1000 Miles begins with the first step!" To take this mission forward, we are coming up with a novel campaign called as 'Empty Plate Campaign'. Every individual taking part in this campaign just needs to make sure his/her plate is empty at the end of the meal as shown in the picture. S/he just needs to click a picture of this empty plate and upload it on 36meals FB page or any other social media channels, he or she is a part of. EPC - Empty Plate Campaign is a very simple concept that aims to make sure there are enough number of empty plates at the end of meals so that no little left-overs are wasted. Only when we consume completely what we gets served on our plates, that we understand how much we can consume. We have seen time and again, that a lot of people leave food in their plates either because they serve themselves too much, or they dislike the taste. Either of the reasons just lead to wastage of more food and nothing else. Just give a moment of thought to this: While on one side of the world, there are people who have the pleasure of making a choice of type and quantity of food, the other side has neither choices nor food. Hence, we feel it becomes our moral responsibility, to make sure that we consume right, in order to protect the right to consume, of someone else. It's more than a duty for all of us, to spread this awareness of not wasting food, in every manner we can. EPC is one possible means to SHOUT THIS to the world. Social media has been a platform to express oneself and connect to the world. Let's use this to spread the awareness for social change. Let's contribute our bit that can save millions from sleeping hungry. Can we count on YOU? We believe - Definitely YES! Step 1:- Make sure there are no leftovers on your plate after your meal on 23rd, 24th Of march. Step 2:- Take a photo of your empty Plate. www.facebook.com/36meals Page or on your Twitter account and tweet to @36meals or any other social media channel you are connected to. You can do it for all 4-6 meals (including both 23rd and 24th of March, 2013) or any one of the meals. It's upto you. Are you in?